The nutrition facts label (also known as the nutrition information panel, and various other slight variations) is a label required on most pre-packaged food. The nutrition facts labels are designed to help consumers make healthy food choices. Nutrition facts give you information that can help you decide what to choose as part of an overall healthy eating plan. Nutrition facts provide more than just nutrition facts. They tell you what's in a packaged food (i.e., the ingredients). Some food labels also state which country the food came from, whether the food is organic, and health claims. 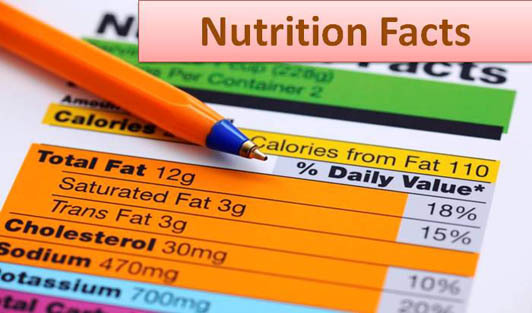 • Nutrition Facts - Each package must identify the quantities of specified nutrients and food constituents for one serving. • Serving Size - Serving sizes are standardized and are expressed in both common household and metric measures. It is always important to pay attention to a serving size. • Nutrients listed - Total fat, saturated fats, cholesterol, trans fatty acids, total carbohydrate (including fiber and added sugars), protein, vitamins A and C, calcium and iron are required on the label. Other nutrients are optional. • Percent Daily Values - Percent Daily Values provide an estimate of the percentage of a nutrient from one serving in a typical 2000 kcal diet. • Daily Reference Values Footnote - This footnote reminds consumers of the daily intake of different foods depending on their own nutritional needs. Nutrition facts can't tell you what foods to eat - that's your decision! But they can help you find foods that taste good and treat your body right.